Trampoline is great for fun and entertainment. However, it is even funnier if users know how to add other accessories into their trampolines. Most of trampolines come with a variety of additional accessories to improve their safety and the great ease of using. Are you ready to enjoy great experience of outdoor activities with our top accessories? 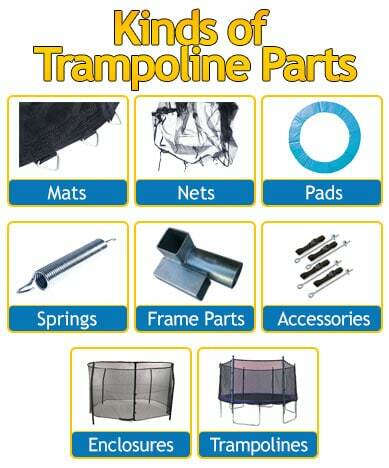 Discover the best trampoline parts and accessories that most of parents invest in this day and age. Ladder is a necessary part to help people easily climb on the trampoline. As you know, accessing the trampoline is not a simple task, especially with the extra equipment of a net. Instead of needing the support from coolers or buckets, a trampoline ladder is considered to be safer than these options. In case the trampoline is not in use, you could take it off to prevent other people from unpermitted climbing. Two most popular options include 2 step and 3 step ladder. We recommend JumpSport 3-Step Trampoline Ladder as one of the first recommendations because of sturdy design and the great ease of assembling different parts. Wind stakes are perfect for areas where are negatively affected by different weather conditions such as wind, storm and more. Many people feel happy with the Skywalker Trampolines 2 In. Trampoline Wind Stakes thanks to galvanized rust resistant steel. This is an important factor contributing to set up the trampoline sturdiness. These stakes are efficiently used to fit trampolines associated with 2 inches of a tubing diameter. It is very simple to set up the wind stakes for enhancing its better stability. All you have to do is digging up to 12 inches into the ground and attaching wind stakes to the trampoline frame. Have you ever been annoyed by a slipping and unsafe trampoline? Then, you should come across JumpSport Trampoline Anchor Kit. The kit is an intelligent invention to protect your trampoline from summer storm or wind. Its stability is created from the equipment of 4 straps and 4 augers. They securely attach to the ground to maximize its stability and durability. You could be rest assured to do cool tricks on the trampoline surface without any pressure of making this tool move. Famous for providing a great number of reliable trampolines on current market, Skywalker continues to make users feel pleased with Skywalker 48 inch Round Bouncer Trampoline with Enclosure. It is designed for children from 3 to 7 years, with 100 pounds of weight capacity. This model is a typical example of a perfect trampoline which associates different accessories inside of the package. The net enclosure is a positive feature of the trampoline. It protects users from falling out of the trampoline mat. The mat is securely attached to the frame due to helpful stretchy bands. There is no spring and it enhances better safety and more jumping space to users. Let your kids enjoy funny experience when sitting or jumping on the trampoline. The equipment of supportive accessories is an important requirement to bring fun and safety to jumpers. Hope you have right decisions in selecting the best trampoline parts accessories in 2016 for your needs and demands. Do you have any recommendations for the most durable replacement safety pad? They all seem to crumble away after a year or two. Any that stand up to the elements the longest? What mats do you recommend for a circular outdoor trampoline?